My parents left for Houston today. Having them around the past couple of months was like a holiday, and I didn't do any painting or illustrating (I have a book in hand I haven't even touched, and my only saving grace is that I didn't get a deadline for this one). It was lovely to have them, and BabyBird is already missing her NanaNani. Even DaddyBoy said the house feels weird without them. We wish they'd move here and stay with us, but I don't know what would convince them that they wouldn't be imposing. Meanwhile, maybe I could fly over to Houston for a few days while they are still in North America, before they head back to India! And now, I really, really need to get back to work! I'm looking forward to being able to concentrate on the many tasks ahead of me, but I also feel empty inside. 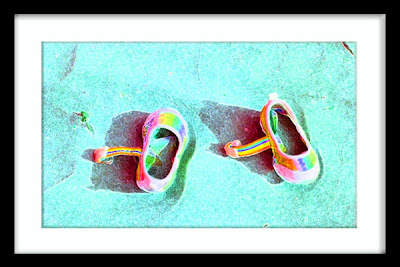 I found this picture I took recently of BabyBird's little baby shoes lying on the sand exactly as she'd taken them off, and it fills me with the same mixed feelings I'm experiencing right now. No, the sand wasn't blue, but those shoes really are rainbow-colored.